Brazilian military police stand near some of the prisoners recaptured after the prison break. BRAZIL: Heavily armed men blew down the front gate of a maximum security prison in northeastern Brazil early Monday and with guns blazing enabled 92 inmates to escape while killing a policeman, authorities said. “Heavily armed men knocked down the main gate after an exchange of fire with police and penitentiary agents,” the state’s secretariat for prisons said. By midday, 41 of the 92 escaped prisoners had been recaptured as security forces locked down the state capital, closing schools and medical centers as a precaution. More than a thousand police officers were mobilized to take part in the search, authorities said. State prisons secretariat head, Colonel Sergio Fonseca de Souza, said the aim of the assault was to free three suspects arrested a year ago for an armed assault using explosives. “The whole of Brazil is going through this situation,” military police Colonel Euller Chaves told reporters. 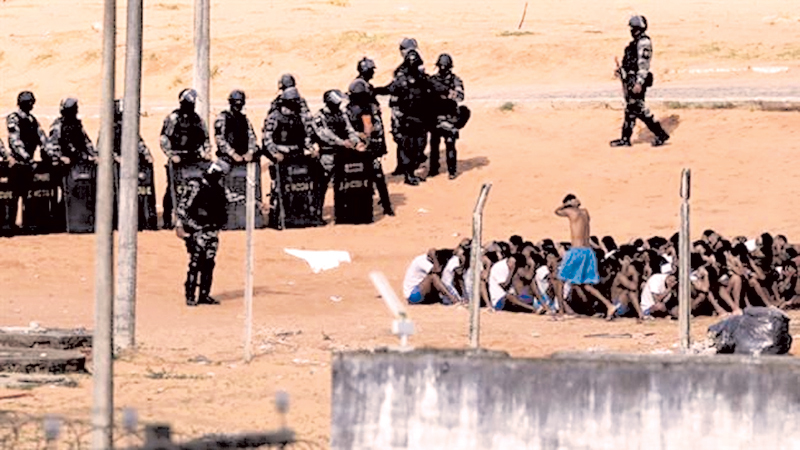 Along with severe overcrowding, Brazil’s prisons are plagued by gang violence, and riots and breakout attempts are not uncommon. In April, a military-style battle erupted between guards and prisoners aided by outside associates, leaving 21 people dead at a prison in Belem, near the Amazon rainforest. The attackers in that case also were heavily armed and tried to blow up a wall to help the would-be escapees. One policeman was killed alongside 20 prisoners and their associates. In February, 18 people were taken hostage during a prison riot near Rio de Janeiro, although guards managed to retake control without anyone being killed.